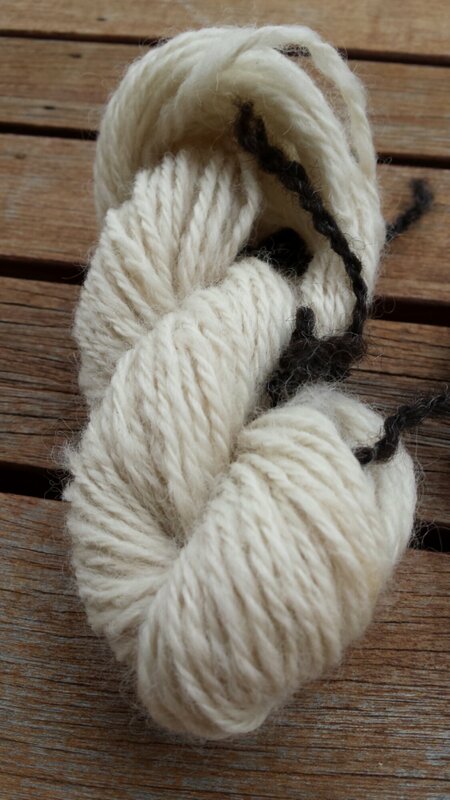 I’m sick of spinning boring white wool. So this weekend I went a little crazy and took over the kitchen for about 6 hours. Two years ago the council environmental board issued the local landowners with a notice to eradicate all blackberries. I understand that blackberries are a noxious weed and that they completely take over creeks and paddocks, but it was also a bit disappointing because I love going out on an early summer morning, to beat the mid-day heat, and collecting blackberries. So that year, I enlisted the help of all my family and friends and every morning before work we would go out and pick the very last of our blackberries. We ended up with I think about 30 kilos of blackberries. I had blackberries on porridge, I made blackberry pies, blackberry sauce, I even tried blackberry ice-cream… but eventually… we all had to go on diets from eating too much pie…so the remaining blackberries went into the freezer. They have been sitting in the bottom of the freezer…sad…lonely…forgotten. Until this weekend. 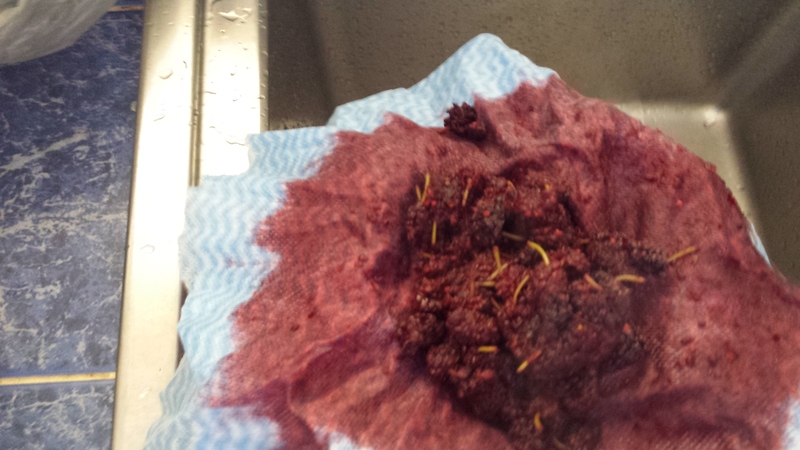 I’m not sure if two year old blackberries are okay for eating…but I figured they would be great for dyeing. 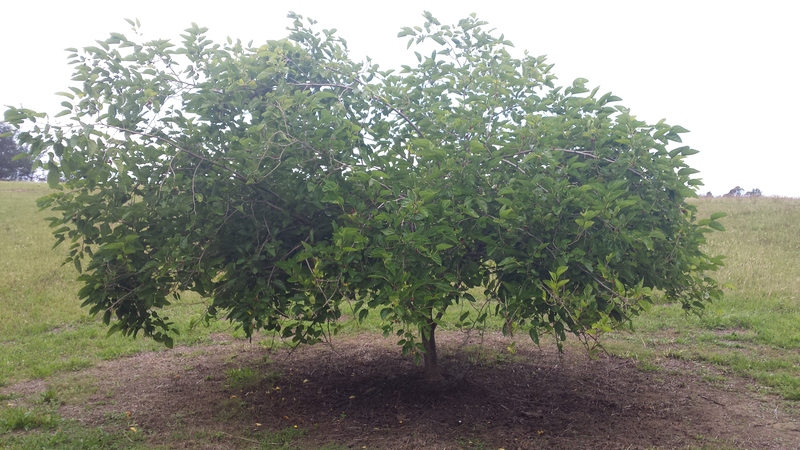 We also have a mulberry tree in the orchard…so I picked a handful of the remaining berries (it’s the tail-end of the season) and got started. 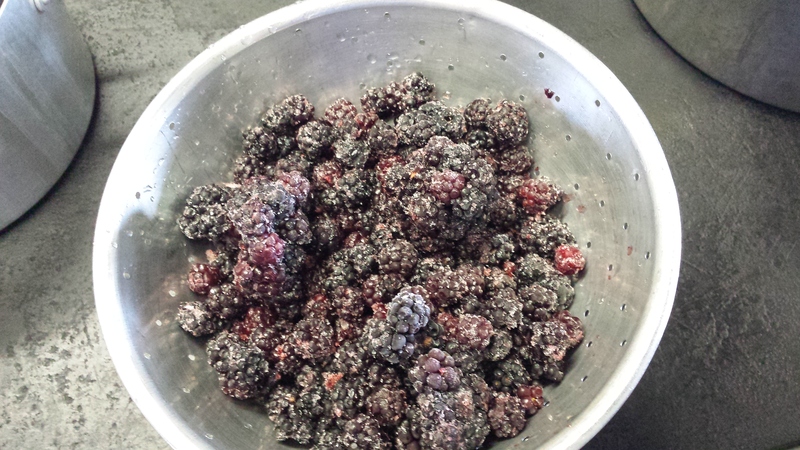 The mulberries and the blackberries went into separate pots – with just enough water to cover them. 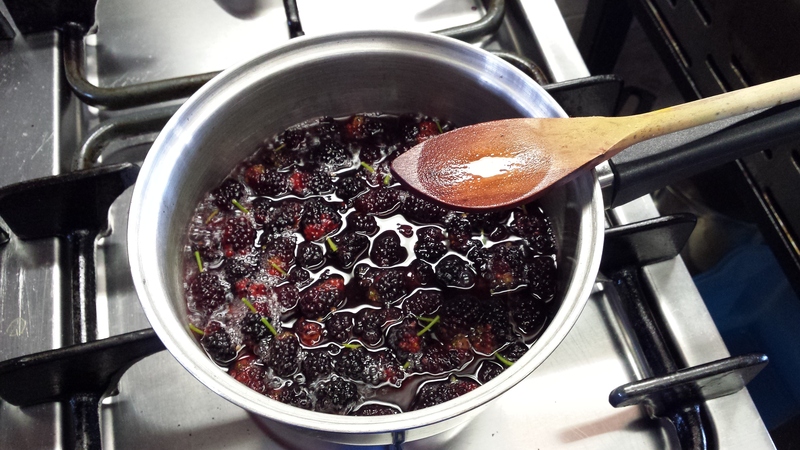 Mulberries on the stove, not yet to the boil. I boiled brought the berries to the boil and then let them simmer for about 30 minutes – or until they are soft and squishy. The strained pulp…not very pretty. What is left is the (hopefully) concentrated dye. If you want it more concentrated, it should be left on the stove to simmer for longer. 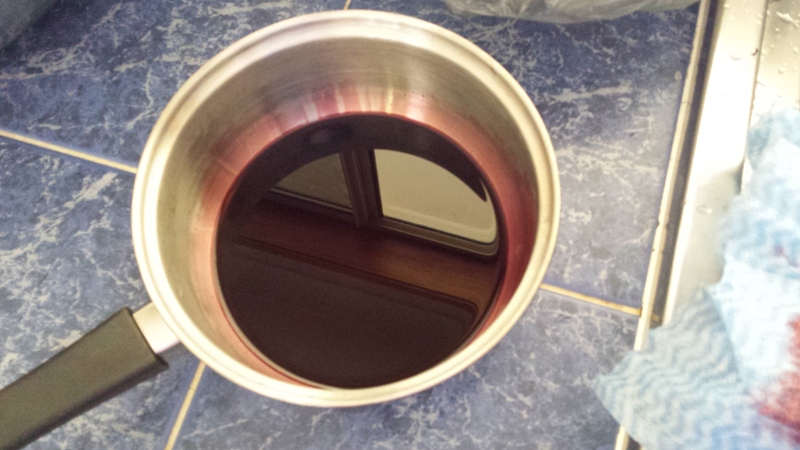 Now we mix the mulberry concentrate with the mordant. I have very limited experience (read none) with mordants… so I decided to try out a few different combinations. I forgot to take measurements … but we didn’t have much Alum left (I really need to go to town soon)… so I only used about a teaspoon, maybe a a teaspoon and a half. 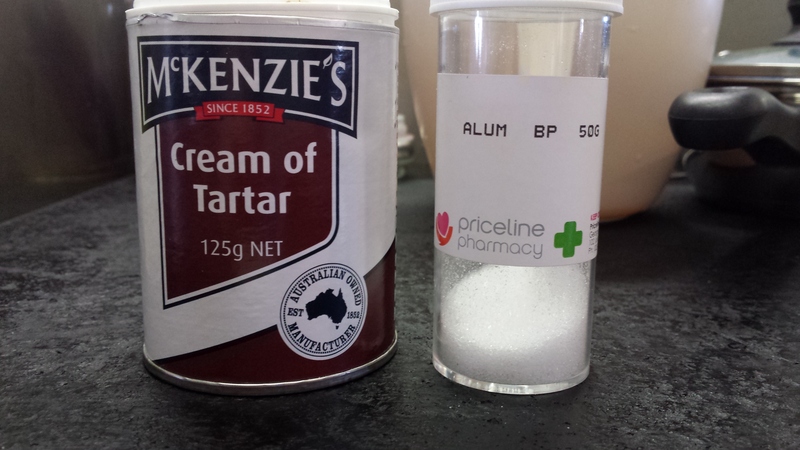 The mordants are then mixed into the concentrate. Now, the exciting part. Take the washed wool and soak it in a water/vingear solution for about 30 minutes (practically, you would do this while cooking the berries). 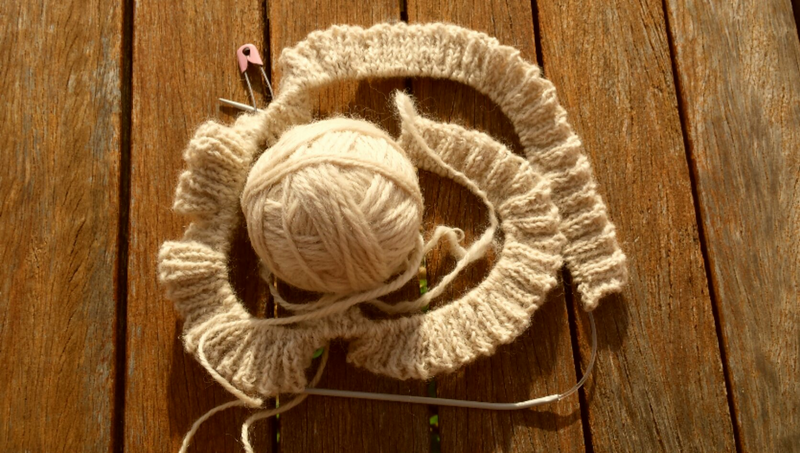 Once the wool is suitably soaked…layer it carefully in the bottom of a saucepan. The wool needs to be just covered with the water/dye. 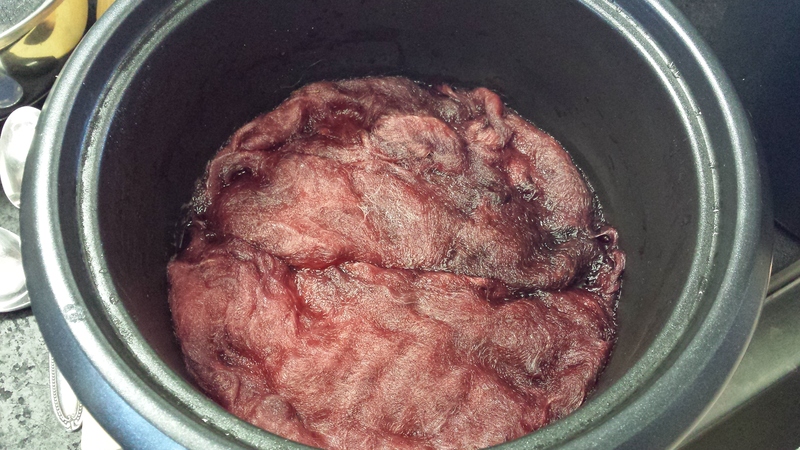 I poured the hot dye/mordant solution directly onto the wet wool. However, I have a feeling that this may have caused the fiber to felt slightly…so next time I will either let the solution cool slightly…or mix it with some water before pouring onto the wool. Looking back at this photo I would possibly add a little more water. Then the wool/dye mix is brought to the boil on the stove and then left to simmer for about 20-30 minutes. After about half an hour, take the pot off the stove and let it sit until cool. This is the hardest part…the waiting…it’s horrible. I wanted to check the wool so badly, in the end I had to go and distract myself with housework. Once the wool is cool, rinse it out with lukewarm water, lightly squeeze dry in an old towel and hang in a delicates bag on the clothes line. 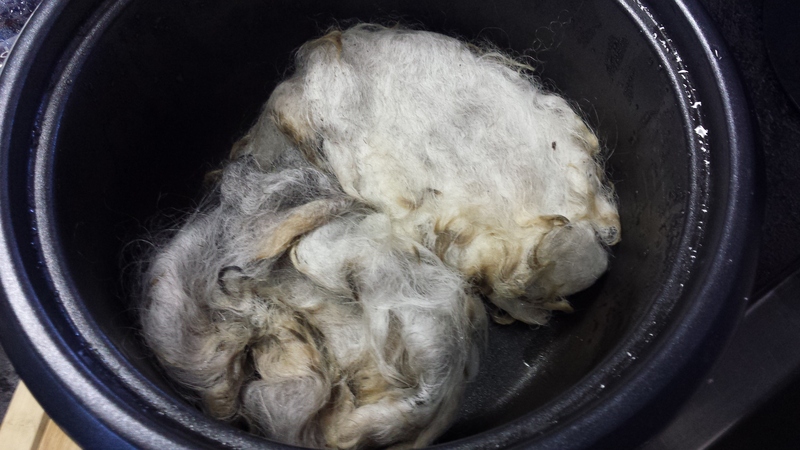 This is the mulberry wool before it is dry. 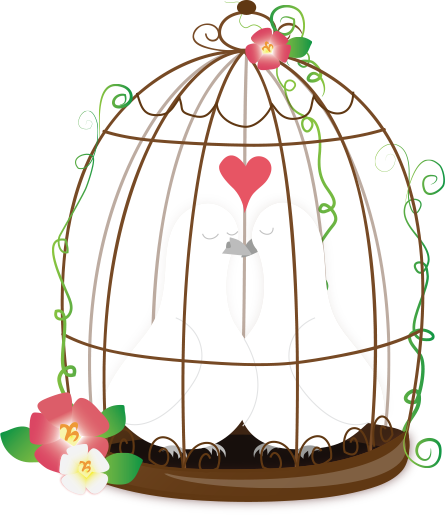 I think it is going to be really pretty. 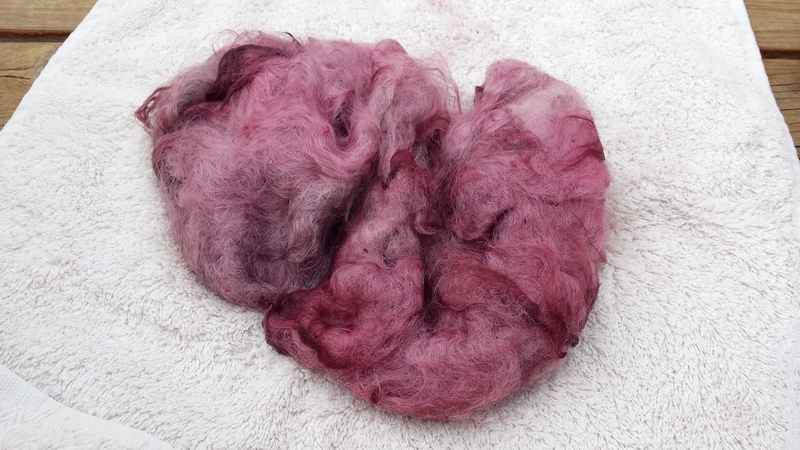 It rained yesterday afternoon and this morning…so it might be a while before I get photos of the dry wool…but my next mission is to spin up all three samples to see if there is any difference and then probably ply them all together. Summer is almost here. It’s only 6 more days until the 1st of December, but already the days are getting longer and the cicadas have arrived. I’ve also cast on for my first major project using handspun, the Bergen Jacket by Drops Design. 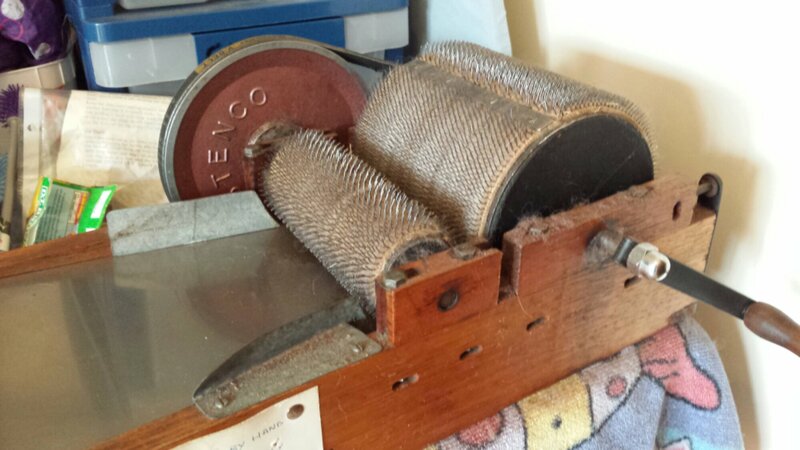 In other news, I have borrowed a drum carder off my local spinning and weaving club (with the aim of buying a secondhand carder soon). 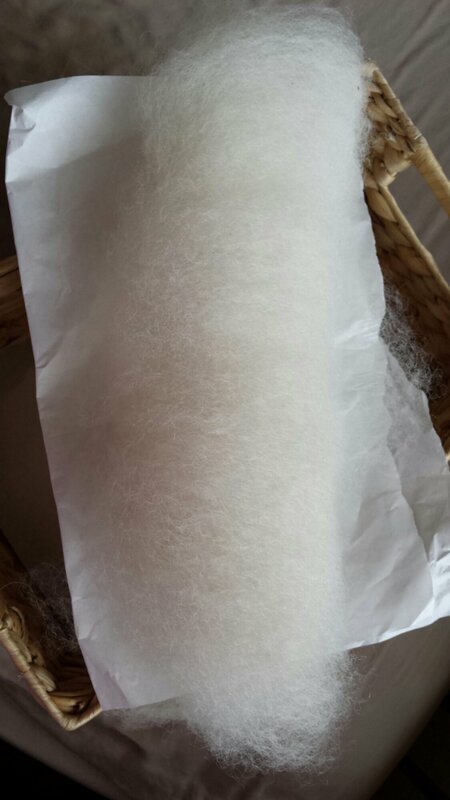 I have previously tried hand-carding (with less than perfect results), so the drum carder is a big improvement. 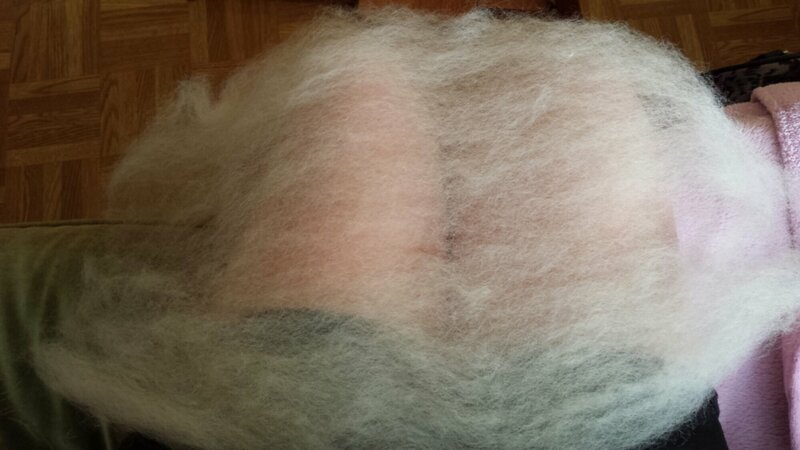 I still prefer using the dog brush to flick open the locks when spinning the one type of fiber, but when blending two fibers together like alpaca and wool, the drum carder is working really well. I’m impatient so my batt is a little thin … but the idea of separating the batt into smaller strips and then pre-drafting them seems to be working very well. 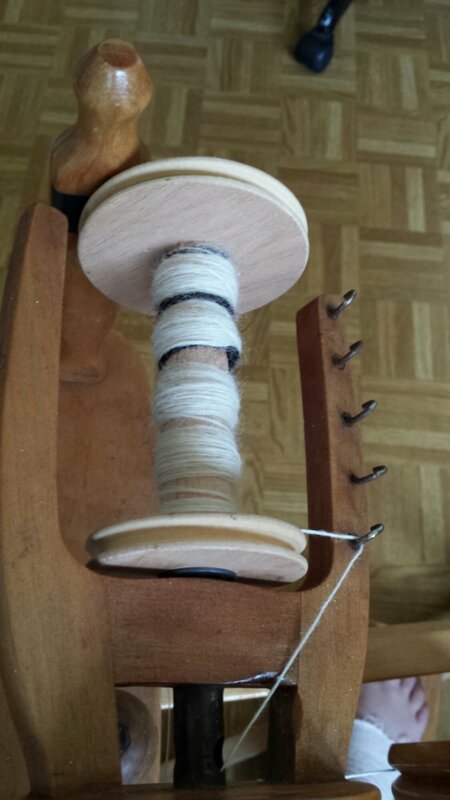 And by also spinning the wool a little thicker i’m not having so much of a problem with lumps in the wool. 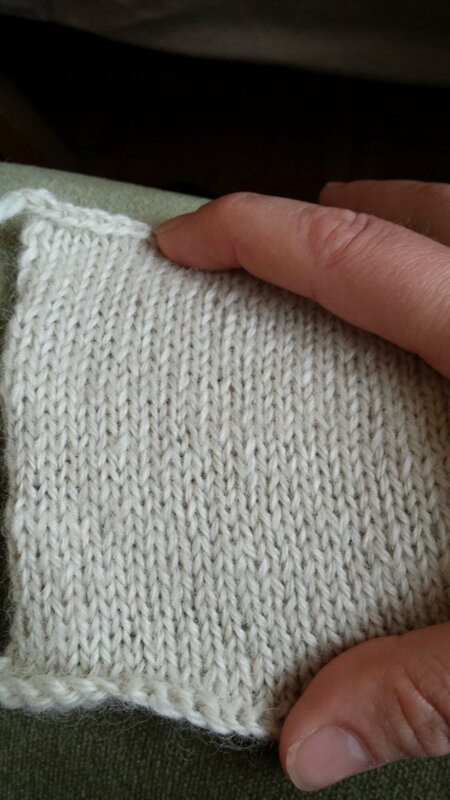 I couldn’t wait to get started knitting, so I started plying (the bobbins weren’t even a third full) and ended up with a 3ply wool that had a weird name like double knitted or something…but either way it worked out at 11 wraps per inch. The pattern didn’t really specify what yarn to use for the cardigan…so I went ahead and knitted up the sampler…and it worked perfectly! So, I know what my next few evenings will be consisting of…as soon as the weather clears up and I can dry some wool.